Which form plugin is the better alternative for my blog? With more and more competing premium WordPress plugins it gets harder and harder to answer that question. This article takes a look at two popular WordPress form plugins: It compares Gravity Forms with Ninja Forms in order to help you with your decision in choosing one. There are several other alternatives to Gravity Forms and Ninja Forms on the market which I have compared in separate articles. Go to my main WordPress Form Plugins comparison to start your search. Please note that this comparison only looks at the features on paper as reported by either plugin’s developers. It does not and can not tell you if or how well a certain feature will work for you. 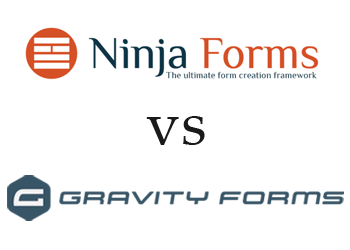 Because such a verdict would depend on too many variables, including your server setup and personal preference, I have decided to stick to the hard facts for this feature comparison between Gravity Forms and Ninja Forms. In my comparison I track 31 different features for all the form plugins. In Gravity Forms you can find 21 out of 31 of those features. Ninja Forms on the other hand offers 24 out of the 31 features in total. Even if many of the features compared above overlap between the two competing products there is one very important difference: Gravity Forms as well as Ninja Forms both provide a unique interface from which you will create beautiful forms on your WordPress blog. Since it is hard to rate the quality of such an interface objectively I recommend that you try both products yourself before deciding for one. WPscoop indexes the exact prixing plans of all compared plugins. Please refer to the table below for a quick overview of the prices of Gravity Forms and Ninja Forms. To find the cheaper form plugin for your individual needs please go to my main comparison article. There you can search for the features you need and then see the exact price you would need to pay for Gravity Forms or Ninja Forms (as well as other alternatives). You can have a look at the Youtube videos below to see Gravity Forms and Ninja Forms in action. That will give you a better idea of how the interface looks and which of the two WordPress form plugins is easier to use. Most WordPress plugins have an option to test their service for free, either thrhough a basic free version, a trial period or online demo. Check if such an offer exists for Gravity Forms and Ninja Forms and if so: Make use of it! By doing so you can compare both plugins directly and find out which one is the better alternative in you situation. But wait, there is more! Besides Gravity Forms and Ninja Forms I have compared several other WordPress form plugins on WPscoop. I recommend you start your search for Gravity Forms alternatives or Ninja Forms alternatives in the main comparison article. There you can filter all different products and search for the features you need. Which one is the better WP form plugin: Gravity Forms or Ninja Forms? Please share your opinion or experience in the comments! Ninja Forms Stripe addon has a known issue. After an incorrect payment attempt, the page has to be refreshed and all the details have to be entered again in order to try new payment. It’s a very serious issue, imagine a customer fill out all the details and made a mistake while entering the Credit card details, now every detail has to be entered from the beginning. They’ve acknowledged that this issue exists and said will be fixed in a future release. I can only speak for Gravity Forms, and we do have the Developer’s License, but I’ve also worked on sites where people mostly only ever had or needed or used the Personal License. In those cases, people had nothing, a terrible no-name plug-in, or Contact Form 7 before. The way the back end is organized for entries is really simple, and pressing buttons or dragging and dropping to ‘draw’ a form is something people seem to find immensely more helpful from a user experience standpoint. It’s also very well-supported and stable, thanks to a constant stream of updates. In my personal experience, they don’t take long at all to sort out questions you might have, and each team member seems to be well-versed in their big, sprawling product. What’s nice is, with a lot of WordPress stuff, it tries to be everything for everyone, but if you only have a small proportion of use cases yourself, everything is bloat. With Gravity Forms, it can do a LOT of stuff (twice we’ve made things that I couldn’t even find in practice online, because it’s so simple to add on, filter or hook into functionality)…but it only goes that deep if you ask it to. Otherwise you can literally build a basic contact form and stick it on your site inside five minutes. The anti-spam measures are easy to implement and enormously effective. If you don’t need forms for much, you can’t beat the price point of “free” for Ninja Forms. We tend to stretch out a bit, so we’ve found that Gravity Forms is a deal and a half when all the great add-ons come with our license, and all the core functionality needs no add-ons. I don’t like things to be any more pieced out than they need to be. Sometimes it’s not even a functional difference so much as a peace of mind thing. Ninja Forms is a great pluging. It has tons of add-ons (more than 40). My favorite one is their integration with Zapier, which allows me to easily connect the Ninja Forms with more than 500 apps (for example, ActiveCampaign or our solution, Sezion). I just wrote an article about our experience using it and a tutorial about how to automatically create a personalized video for every Ninja Forms form response using Zapier and Sezion: http://blog.sezion.com/flexible-contact-forms-wordpress-ninja-forms. One thing I “don’t like” about Ninja Forms’ Zapier app is that it’s a paid app, but you can use their email notifications as a trigger (for example, in our case, to create a personalized video every time we receive an email notification for new form responses to increase lead engagement). Other form plugins offer the Zapier integration for free, but they also have different business model. I’ve used Gravity forms for at least 40+ websites. It does support stripe now. That said, Ninja forms seems like a great free alternative for simple forms. I’m using GF at the moment but it’s killing my RAM memory. Anyone an idea how to overcome, or what’s wrong it taking so much Memory? I’ve using Gravity forms Dev license. but, I saw Ninja form awesome plugin form too. Hello Thomas, do you know any free alternative to gravity forms? Hi John, there are many free WordPress form plugins but I do not have much experience with them and could not recommend any specific one to you. Try searching the wp.org plugin directory and you will find them. Most will be more suited for basic contact forms however and might not offer advanced features of premium form plugins like Gravity forms. Thanks for this post. I’m leaning away from Ninja forms. Every 2 or 3 updates their form breaks and this literally kills my business. I don’t know about anyone else, but it’s happed to me 3 times (across all my wordpress installations that have it) and right now is the most recent. Looking for a better option that doesn’t ruin communication with my customers. Thanks for your comment! Feel free to leave a rating for Ninja Forms on the reviews page as well. Thanks for the great comparison. I’m both using Gravity & Ninja Forms at the moment and love them both. Ninja Forms now also works with Zapier – we’ve recently launched the official Ninja Forms – Zapier plugin (http://ninjaforms.com/extensions/zapier/). Could you update your comparison table? Thanks for this ! I could not made my mind to which one I should go for ! very comparison ! !